Shurara (Syurara in Kunrei-shiki) is a character appearing in Keroro Gunso and Keroro Land. Shurara is the leader of the Shurara Corps. Unlike other Keronians, his body has two colors. The right side is purple and the left is green. The tip of his tail is pointed. His symbol is a blue circle with squares on the sides and a row of three small black rectangles pointing upwards, resembling the head of an armor. He also wears a helmet with two colors: gold on the left and silvery on the right. His right eye is black with a blue pupil and his left is red with curved points on the side and a yellow pupil. The stripes covering his right eye are three vertical lines, and those on his left eye form a cross. His right arm is equipped with a spear and his left handles a shield. His helmet has blades on the sides and horns on top. Unlike other Keronians, Shirara does not wear a cap, instead, he has two extrusions on both sides of his head. Shirara&#039;s symbol is a star similar to Keroro&#039;s, but each point is more blunt than Keroro&#039;s. His right eye is blue and the left is yellow. His voice and speaking style is also different from Shurara&#039;s. Shirara also has a huge crush on Pururu. 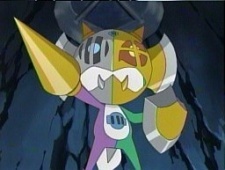 In episode 203, Shurara was unmasked as one of Keroro&#039;s classmates, Shirara. Keroro is also the reason for the grudge he bears against the Keroro Platoon. As a child, Shurara was known as Shirara, and possessed the same two body colors as Shurara. However, unlike other Keronians, Shirara does not wear a cap, instead, having two extrusions on either side of his head. Shirara&#039;s true symbol is a star similar to Keroro&#039;s, but each point has been blunted. His right eye is blue and the left is yellow. His voice and speaking style is also different from Shurara&#039;s.